Patan is also known as Lalitpur- the city of fine art and architecture is said to be one of the oldest and most beautiful medieval cities in the world. The artists have created many beautiful temples, shrines, and palaces in the Durbar Square. This is a wondrous place to see historical and finest arts lovers. It is another largest world heritage site city after Kathmandu and Bhaktapur city and it is situated south-central part of the Kathmandu valley. Which is seven kilometers far and 25 minutes' drive from the Kathmandu; There are numerous important shrines one can visit such as Char Narayan, Bishwa Nath, the large rectangular three- storied Bhimsen temple, Chyasilin Dewal, the five-storeyed Kumbheshwar Mahadev, Golden temple, Hiranya Varna Mahavihara and many other monuments. 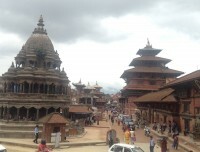 Patan is smaller in size but it includes a number of unique architectural styles. The most spectacular examples of Nepalese architecture in town framework. Appropriate in the hustling's center, Mangal Bazaar stands the famous palace of the Malla Kings well-known as Mangal Rajprasad, built in the period of the Lichchhavi era (an establishment in the first to 9th century). A highly inspiring and attractive monument is Lord Krishna's stone temple, positioned in a striking location in the Durbar Square compound. The King Siddhi Narasimha Malla made this temple in 1636. The Patan Krishna temple is indisputably one the optimum stone structures in the Kathmandu Valley and is, thus, of significant national reputation. This sightseeing day tour is an important habitation to visit for the little period travelers to Nepal. This tour also provides you with an ancient medieval kingdom's history, Nepalese art and architecture masterpieces and many other exciting places. We organize this wonderful tour to offer a glimpse of an ancient culture and history as well as Nepalese arts. This wonderful sightseeing tour will lead our professional city guide. During the trip, we will use a luxury private vehicle. We offer this trip with reasonable cost as well as higher level service. You will get sufficient opportunity to purchase authentic souvenirs, including Tibetan carpet, handicrafts, traditional painting Thankas on this trip. Day01: Patan World Heritage Site Sightseeing including Durbar Square and many more ancient places. Hotel pickup and drop by private tourist vehicle. An experienced licensed holder city tour guide. All necessary entrance and monuments fees. All government vat and tax. Any others expenses which are not keeped on 'Price Includes' sector above.